Preston's College is one of the largest and most successful colleges in England. We were tasked with developing a website that would appeal to students, with a clear user journey and high conversion rate. The main criteria was to have a highly accessible site to allow website admins to easily update and maintain the site supported by a digital marketing strategy. One of the main problems we encountered with the legacy website was the significantly large amounts of course information, that needed to be no more than 2 clicks away. 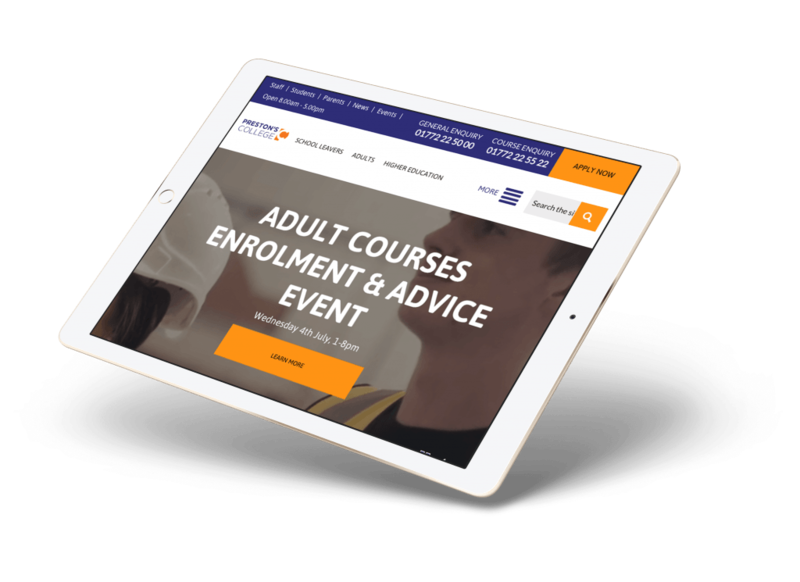 Our solution was to develop a unique and bespoke course finder that made it easy for users to drill down, giving the user an experience that was top notch. To top it off, we added a built-in SEO function in order to provide site admins with minimum SEO experience and knowledge the opportunity to optimise their content according to the SEO best practices. The website is easy to navigate and search for courses. Either by using the homepage search box or drop-down navigation, meaning that courses are only one click away from the homepage. The proof was in the pudding and when the new clean website was developed and launched. There were well over 1,000 course enquiries and brochure downloads received in the first two weeks of the launch date. The navigation is divided up into School Leavers, Adults, and Higher Education to allow for better use of social media. The YouTube feed contains all the videos for the college’s stars who explain the many benefits of studying at Preston’s College. The new site is also fully responsive and built on WordPress, which means the site is completely editable. This allows Preston’s College staff members to upload and change content and images in all areas of the site. The navigation is divided up into School Leavers, Adults, and Higher Education to allow for better use of social media. The YouTube feed contains all the videos for the college's stars who explain the many benefits of studying at Preston's College. The new site is also fully responsive and built on WordPress, which means the site is completely editable. This allows Preston's College staff members to upload and change content and images in all areas of the site. Preston’s user interface was designed to be clean and user friendly, utilising the brand colour scheme of yellow and purple and also by using the yellow for the CTA and action buttons and purple for drop-downs and navigation elements. Tangible results could be seen within the first two weeks of the website launch, with Preston’s College taking an unprecedented 2500 enquiries. It was a clear indication our school, college, or university web design and marketing skills can transform a education centre’s fortunes around. Both the service and the end product from Soap was excellent. The team took a complicated, text heavy site with accessibility issues, and delivered for us a clean, impactful web presence that is easy to navigate. Being a further education provider, accessibility of the site is key to ensuring that we can provide information to people of all abilities and needs. Soap were robust in their approach to this and yet delivered the website at speed, to quality and on budget. A great job!